Nef The Pharoah & 03 Greedo Join Forces On "Porter 2 Grape"
Home>New Mixtapes>Nef The Pharaoh Mixtapes> Nef The Pharoah & 03 Greedo Join Forces On "Porter 2 Grape"
The #FreeGreedo is in movement is in full effect since the Watts rapper turned himself in to authorities to serve a 20 year bid. The good news is that his lawyers have said that on good behavior, he could be out earlier but that's not guaranteed by any means. Prior to his incarceration, the rapper locked in a whole lot of studio time to bank up on content including a few collaborations. Today, Nef The Pharoah drops his joint project with 03 Greedo, Porter 2 Grape. 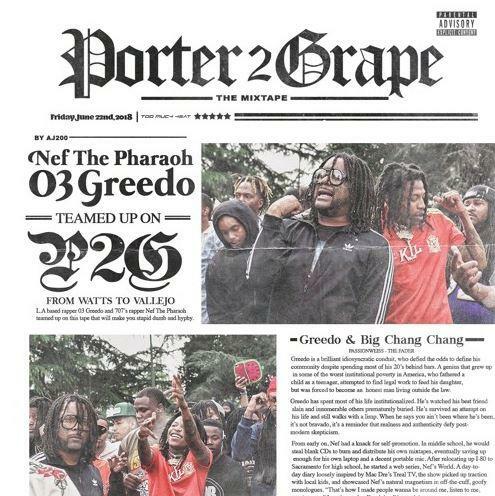 03 Greedo and Nef The Pharoah bring it from Watts to Vallejo on their joint project, Porter 2 Grape. The project is only five tracks deeps but it shows the great chemistry and bond between the West Coast rappers. The two rappers bring a few friends along for the ride with ALLBLACK jumping on two tracks and Chris O'Bannon assisting on one of them. If you're into West Coast hip hop, this is a project you should be vibing to while you head into the weekend. Black Atlass Celebrates New Chapters In His Life With "Pain & Pleasure"
MIXTAPES Nef The Pharoah & 03 Greedo Join Forces On "Porter 2 Grape"